Who is a “Senior” or “Vulnerable” Investor? Establish Policies That Will Assist in the Identification of Persons Covered Under Applicable State Laws or Regulations Designed to Fight Financial Exploitation. Develop and Regularly Review Training Programs Designed to Educate Employees to Recognize Signs of Diminished Capacity and Financial Exploitation. Develop Special Tips and Strategies on How to Communicate with Persons Experiencing Diminished Capacity. Provide Training to Frontline Employees on How to Ask Appropriate Questions Regarding Potential Cognitive Decline While Still Maintaining a Client’s Sense of Autonomy and Dignity. Train Personnel to Assist with Recognizing Signs of Cognitive Impairment Despite the Fact that Standards for Qualitative Assessments are Unclear. Review and Consider Adapting Existing Training Materials from State APS Agencies and Others. Training Materials Should Include Information on Resources for Addressing Financial Exploitation and Other Forms of Elder Abuse. An initial step in determining how best to protect senior investors or vulnerable adults is identifying who is covered under applicable laws. Therefore, identifying which of a firm’s clients may qualify for protection under statutes designed to combat financial exploitation or otherwise protect seniors is the likely starting place when developing policies, procedures, and practices meant to accomplish this goal. Existing laws and the NASAA Model Act often have explicit definitions of which individuals fall under the purview of these statutes. For example, the NASAA Model Act uses the term “eligible adult,” and sets out a two-part definition that triggers the Model’s other provisions, including reporting requirements. Firms also should consider how they will identify investors who may be targets of abuse, exploitation, or be more likely to suffer from some form of diminished capacity. As noted above, the NASAA Model Act is applicable to “eligible adults.” This term is defined as any individual age 65 or older, and also includes any adult who would be subject to the adopting state’s existing adult protective services laws. Although the NASAA Model Act and many other related state laws contain a triggering age, such laws may also apply to adults—regardless of age—exhibiting certain mental or physical disabilities. NASAA’s Model Act expressly incorporates the adopting state’s adult protective services’ definitions. Firms should develop training programs and procedures to better educate client-facing employees and their supervisors to recognize the signs and red flags that may indicate that a client or customer is in need of APS protections, whether financial or otherwise, or that raise concerns about diminished capacity. It is important to note, however, that certain provisions of state laws and the NASAA Model Act, such as delaying disbursements or notifying third parties, are only applicable if financial exploitation of an eligible adult is suspected. Other practices, such as obtaining trusted third-party contact information, may be used to provide similar protections when a client triggers concerns about diminished capacity. Equipping employees with the tools necessary to recognize red flags and other warning signs is critical to mitigating the damage so easily suffered in these situations. As noted above, firms should develop policies, procedures, and training programs to teach their employees how to recognize signs of diminished capacity, cognitive decline, financial impairment, or financial exploitation. Financial professionals, particularly those with an ongoing relationship with the client, are in the unique position of being able to identify early signs of diminished capacity and red flags indicating financial exploitation. Financial professionals often notice, in their previously “sharp” clients, changes in comprehension or impairments to mathematical skills indicating diminished financial capacity that may, because of slow onset, be difficult for family members to recognize. Also, these professionals often can recognize changes in behavior or unusual financial activities that might indicate that the client is being exploited. Early identification of these issues may prevent a client or customer from becoming the victim of financial exploitation. Detecting and recognizing the signs of cognitive impairment or diminished capacity begin with developing strong relationships with the individual customer or client. As part of this relationship building, firms should increase the frequency and quality of communication with their clients, as many of the red flags signaling potential cognitive issues, such as memory lapses, disorganization, arithmetic mistakes, conceptual confusion, and impaired judgment, can be detected in routine discussions with clients and customers. Firms should consider providing client-facing and other personnel, such as supervisors and compliance staff, an assessment tool for cognitive skills that can be incorporated into ongoing training on how to communicate with clients. In discussions with stakeholders, several indicated that many people may be reluctant to talk about cognitive decline, but may be willing to discuss what to do with their finances in the event of a medical or other emergency. Discussions in this context provide an avenue to discuss powers of attorney and other advance directive options. Ideally, these types of discussions between a financial services professional and a client would take place upon account opening, at regular intervals thereafter, and as circumstances dictate. Ongoing communication with a client is critical both to establish a baseline from which to assess any behavioral changes or cognitive decline and to recognize when protective measures may become necessary. impaired judgment, can be detected in routine discussions with clients and customers. Firms should consider providing client-facing and other personnel, such as supervisors and compliance staff, an assessment tool for cognitive skills that can be incorporated into ongoing training on how to communicate with clients. Enhancing supervisory oversight for an account where there is a suspicion that a client may be vulnerable. Documenting contact with seniors in case they have problems with lack of recall or need assistance with resolving any misunderstanding. Developing escalation procedures. Broker-dealer agents and investment adviser representatives should document suspected diminished capacity and escalate immediately. Policies should indicate to whom the matter should be escalated and when, though employees should be trained to do this early – at the first sign. The investor appears unable to process simple concepts, such as:An integral component of a firm’s policies and procedures should be training to spot the signs of cognitive decline or a reduced capacity to handle financial decisions. While there is no definitive list of the signs of diminished capacity or cognitive decline, in discussions with the various stakeholder groups and a review of prior reports on the subject, the following examples of “red flags” were cited. confusion and loss of general knowledge regarding basic financial terms and concepts such as mortgages, wills, and annuities. failure to fulfill financial obligations such as paying bills, or paying the same bill multiple times. In developing policies and procedures and training programs, firms may want to review existing training materials developed by state agencies. These programs typically address the threshold issue of identification of impaired capacity and can be adapted to fit financial services models. The materials also may provide an avenue to enhance relationships between the financial industry and local APS agencies—an important step in protecting the financial well-being of senior clients. NASAA has developed a training program entitled Senior$afe, designed for broker-dealers and investment advisers. 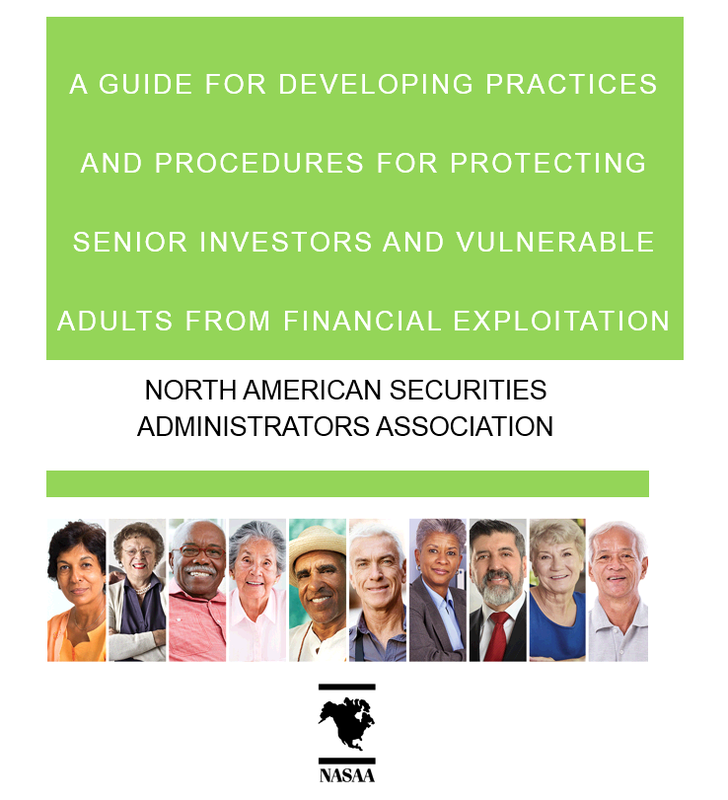 For more information, please contact your state securities regulator.Having strong, cooperative relationships among the financial industry, APS agencies, state regulators, and law enforcement is critical, as each group brings a unique perspective, skill set, and ability to act in order to protect seniors. When such cooperative relationships are in place, open communication is fostered between key stakeholders who can work together to protect our aging population. Information on how to contact the local APS agency or state securities regulator can be found at www.serveourseniors.org.